Silk Road: Maritime Route - HISTORY'S HISTORIESYou are history. We are the future. Much of the maritime trade began in the ancient port city, Guangzhou. The Buddhist temple above doubled as a lighthouse there. More silk and Silk Road goods reached the West by way of sea routes rather than overland routes. 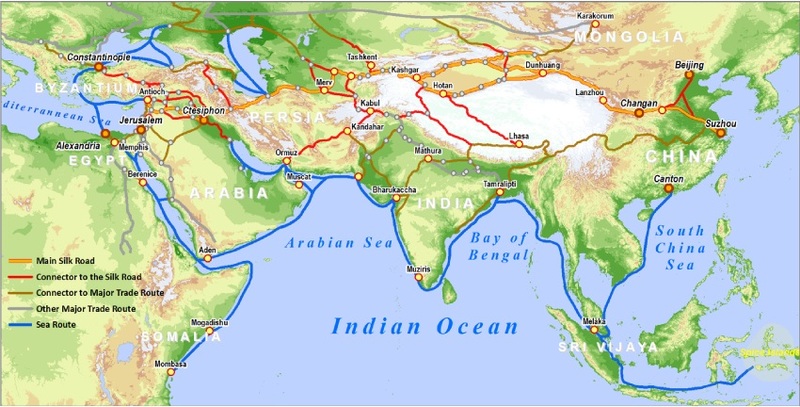 The main Silk Road sea routes were between Indian ports like Barbaricon, Barygaza and Muziris and Middle Eastern ports such as Muscat, Sur, Kane and Aden on the Arabian Sea and Muza and Berenike on the Red Sea. From the Middle East goods were transported overland to the Mediterranean Sea and then Europe. From India goods flowed to and from Southeast Asia, the East Indies and China. Much of the trade on the Maritime Silk Road was carried out by Arab, Persian and Indian ships called dhows, not by Chinese ones. The trip was dangerous. Many ships disappeared and no one has any idea where they went down. ​Small boats hugged the shore. Large boats sailed the seasonal monsoon winds, which carried boats eastward to India in July, August and September and westward from India to the Middle East in December, January and February. The largest teak-hull ships that sailed these routes may have been 180 feet long and capable of carrying cargoes of 1,000 tons. Around the 7th century AD, during the Tang Dynasty and 500 years before Marco Polo arrived in China, Silk Road land routes fell into decline as sea routes opened up between China and the Middle East. An extensive trade network between China, Southeast Asia, India and the Middle East was established by Arab traders. As a result, Chinese coastal cities boomed. Guangzhou in China had 200,000 foreign residents, including Arabs, Persians, Indians, Africans and Turks. It’s not difficult to see why the caravan routes were being abandoned. Those routes were treacherous and time consuming. Routes that passed through western China crossed some of the most barren and inhospitable deserts on earth. When the going was easier, thieves and bandits were a constant threat that traders had to worry about at every turn. If they survived the bandits, merchants were expected to pay bribes and commissions to middlemen and officials. By contrast, sea routes were faster and easier, and there were fewer transactions and officials. A trader who purchased goods in the East could have control over the goods until they reached ports in the West and make greater profits by eliminating middlemen. The biggest risks with sea travel were storms, disease, and pirates. Land routes did begin to open up again when the sea routes became plagued by pirates. When the Mongols ruled, they eliminated petty states and local officials by creating a huge unified empire that stretched across Asia and Europe. Those moves also helped to make land travel more appealing. Marco Polo traveled by both land and sea, but he reported more trouble when he traveled by sea. ​One of the greatest ancient Middle East ports was Bernelike on the Red Sea. Berenlike was founded in the 3rd century BCE, rose in importance in the 1st century BCE, and was at its peak in the 1st century AD. In the 1990s archaeologists discovered this ancient city under the sands about 600 miles south of modern-day Suez, near the border of Egypt and Sudan. They found evidence of trade with Thailand and Java, and inscriptions in 11 languages including Greek, Hebrew, Coptic, and Sanskrit, clues as to how the Silk Road sea route linked together the ends of the ancient world.